Data Dealer: Privacy? Screw that. Turn the tables! Living on the net and your phone? Worried about your privacy sometimes? 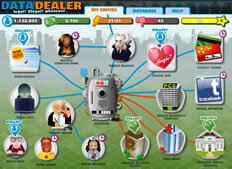 Become a data dealer and get all the dirty details on your friends, neighbors and the rest of the world. Collect the best data delicacies from your underground sources, and create companies and online ventures. Build your own data empire! ...with sweepstakes, dating agencies, online personality tests and your own social web. Rise from small-time back room data dealer to become a mighty data mogul! Turn your database into a money machine! Even the tiniest details could be worth their weight in gold. Check out our video trailer, play the demo (below) or sign up for the full version beta: Start with a fresh account and play right away! 3 shady agents and 5 darknet sources. Run 4 companies & online ventures with more than 50 upgrades! Over 30 profile attributes attainable for each profile in your database. You´re starting with 1 Mio profiles & some pre-loaded game progress. For testing purposes: short timer periods, high energy level. No intro story (yet), no multiplayer, no login, no save & no sound. Browser Requirements: Current Version of Chrome, Firefox, Webkit, Safari, Opera or Internet Explorer 9+. Based on HTML5/SVG, no Flash! ▶ Tell your friends, blog, share, tweet, make some noise! Brilliant suggestions, cute complaints or even praise & worship? Bring it on! We won the Games for Change "Most Significant Impact" Award 2013! We've been getting amazing feedback, which feels pretty awesome after all the hours we have put into developing this thing! "An online game that explores the personal data ecosystem on the Internet"
"The most amusing way to learn the depressing news about your vanishing privacy"
"Lets you 'play god' with personal data"
"A game that plays with private information"
"Play the part of a nefarious data dealer and see our privacy-free future up close [...] In this new award-winning game, you can see what it’s like to try to grab and monetize people’s private data"
"learn about how [your] own information is collected and commodified along the way"
"Spreads awareness about how some companies gather personal data and why others want to purchase it"
"Puts players in the perspective of some of the most powerful and ubiquitous tech companies at the center of our current cultural and technological anxieties"
"Don’t miss the game’s Tracebook — er, Facebook page"
"This game is just like real life!" "The characters are colourful and amusing. But the scary bit is the message behind the game." "This light-hearted game uncovers the darker side of online registration pages and forms we come across everyday"
"Will this game be successful in educating people about how data is used? Almost definitely"
"Offers up privacy awareness in great gaming style"
"Mixes gameplay about surveillance, personal data and privacy with some witty humor and some mild mockery of the world's biggest online destinations"
Background info, frequently asked questions. Press information, key facts, downloads, images, background info. Meet our team! Plus: credits, partners. Data Dealer on Facebook, Twitter, Google+.